Of course, there can be anxieties around whole class reading, even as part of a ‘mixed-economy’ alongside work with small groups. Another is around inclusiveness: will all pupils receive equal attention and have similar opportunities to contribute and practise? Another is assessment: it may be harder to do fine-grained monitoring of individuals’ progress. Some teachers are concerned about managing behaviour for learning, if there are more demands on pupils’ autonomy. These anxieties can make it more likely that, when teachers do experiment with whole-class reading, they structure lessons in very formalised ways. There may be a similar agenda for every session, with pupils always moving through a set series of activities. 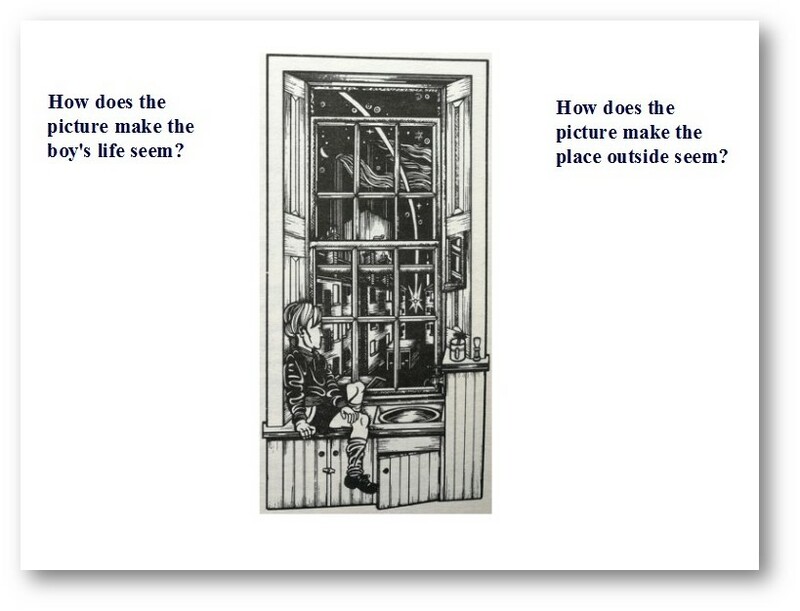 Texts might be subjected to quite repetitive kinds of interrogation, with pupils asking and answering similar questions each time. Such repetition can be reassuring. However, it can also be limiting, denying the potential of individual texts to teach particular aspects of reading, to demand particular kinds of thinking, to invite different kinds of response, and to offer opportunities for a variety of kinds of engaging, classroom activity. 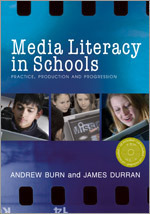 The contrasting approach is to have no set formula for whole-class reading sessions, but to let planning be flexible, led by the text’s potential – what the particular text or section of text offers in terms of learning and approach, by the shifting needs of the pupils, by the class’s developing relationship with the text as readers and – of course – by the inventiveness and resourcefulness of the teacher. This, of course, places considerable demands on the teacher’s subject pedagogical knowledge. This is where strong collaborative planning of medium-term plans can be important, and where access to published plans and materials relating to texts may be very helpful. 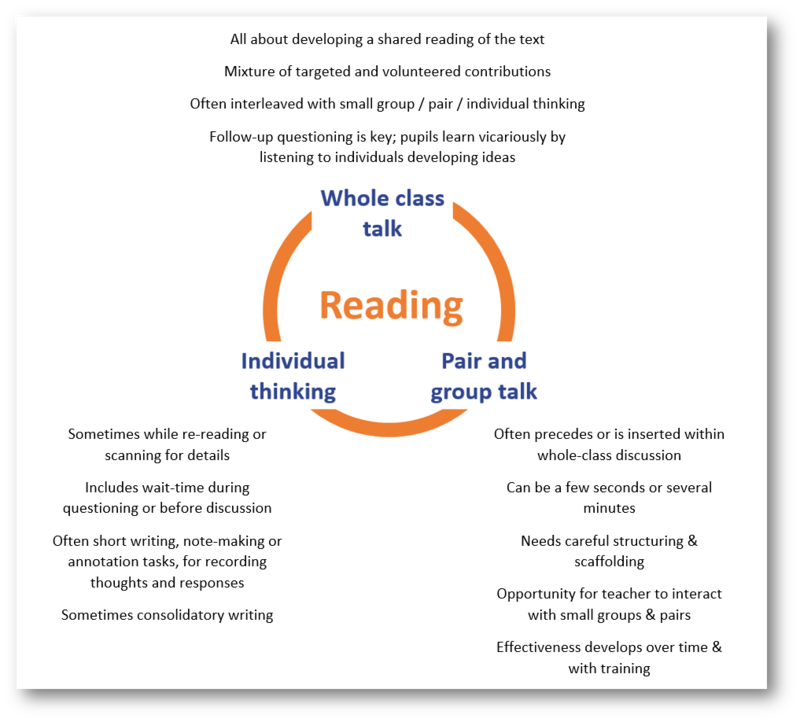 But even with such supportive plans and resources, teachers need to know how to pitch reading sessions high, while providing scaffolding to allow all pupils to access the text and practise reading and responding in challenging ways. In my experience, this usually means a blending together of whole class talk, pair or small group talk and individual thinking. They also need to be skilled at asking follow-up questions, to generate the sort of authentic dialogue in the classroom which develops real depth in pupils’ responses and thinking. And they need confident access to a repertoire of activities and approaches, out of which to build effective lessons. There are, of course, excellent texts which teachers can turn to for deeper guidance, such as the excellent Guiding Readers – Layers of meaning (Tennent, Reedy, Hobsbaum, Gamble, 2016) which also has excellent sections on scaffolding, on questioning, on developing dialogue and on ‘text potential’. Some of the activities listed here could take up just a few seconds of a lesson; some are more extended. For most of them, the talk and the follow-up questioning which surround them are key. Most will be carefully planned into a lesson or teaching sequence, in which whole class, individual and small group/pair talk are intertwined; some, however, will be spontaneous or responsive, inserted where appropriate. 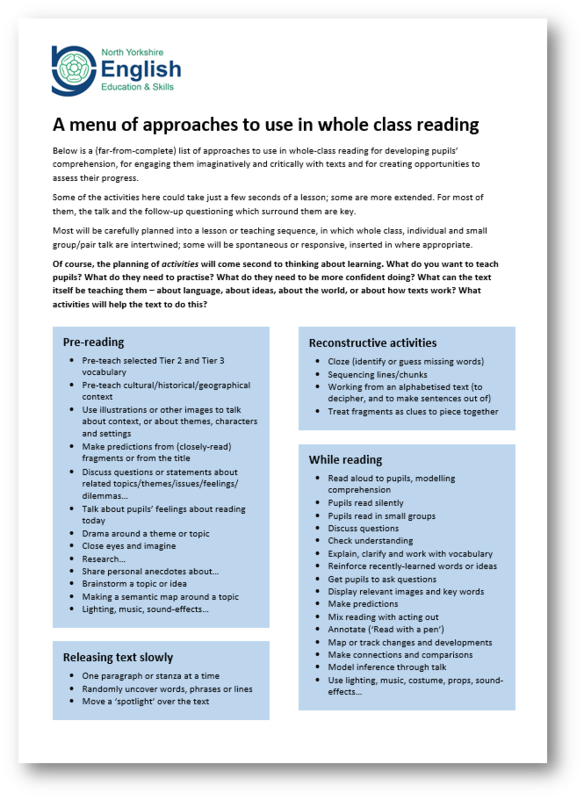 In case it’s of interest, below is an account (with IWB slides) of a demonstration whole-class reading lesson which I recently taught to a Year 5 class. Lasting about 75 minutes, it really had enough activity for two or three sessions compressed into it. It is far from a perfect model, but might be useful for triggering discussion. 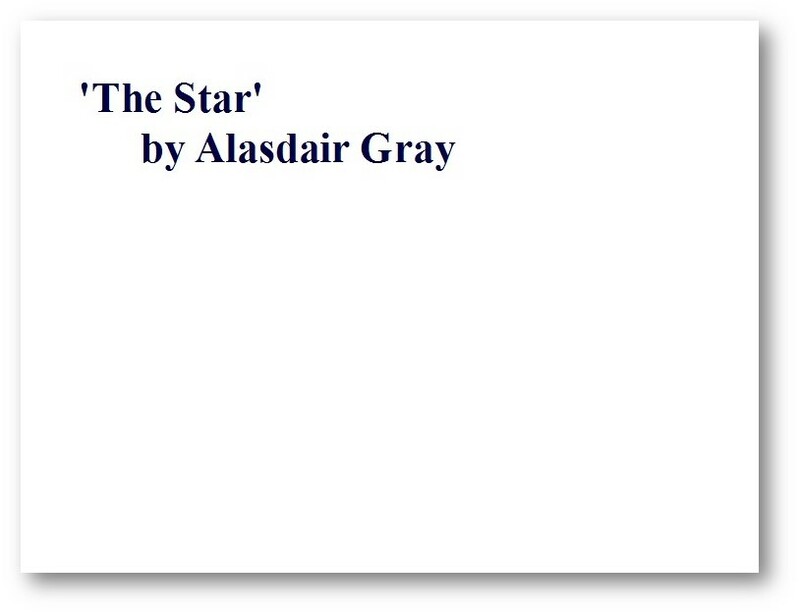 The text was a short story by Alasdair Gray, called ‘The Star’ from Unlikely Stories Mostly. (Download a PDF copy here.) This was quite a challenging text, especially for some of the less fluent readers in the class, but they enjoyed it and pupils of all levels of attainment discussed it confidently. As pupils settled, this illustration from the story was on the board. Pupils discussed the two questions at their tables. I then fielded ideas – from targeted individuals, and from volunteers. Discussion focused on the boy’s posture and attitude. Pupils said he looked lonely, fed-up, bored, miserable… I got the whole class to enact each suggested mood, sitting at their desks in a ‘bored way’ or a ‘miserable way’ and so on. Several thought that he looked trapped, and that he wanted to be free, so we talked about that. Why? Free from what? How familiar is the feeling? The barred window was mentioned, and the exciting-looking stars in the distance. I explained that we were going to read a story with this title, and that I was very interested in their ideas about it. Opportunity (not taken) to explore the title: we could have explored associations with stars and the word’s different meanings. How might these connect with the picture? 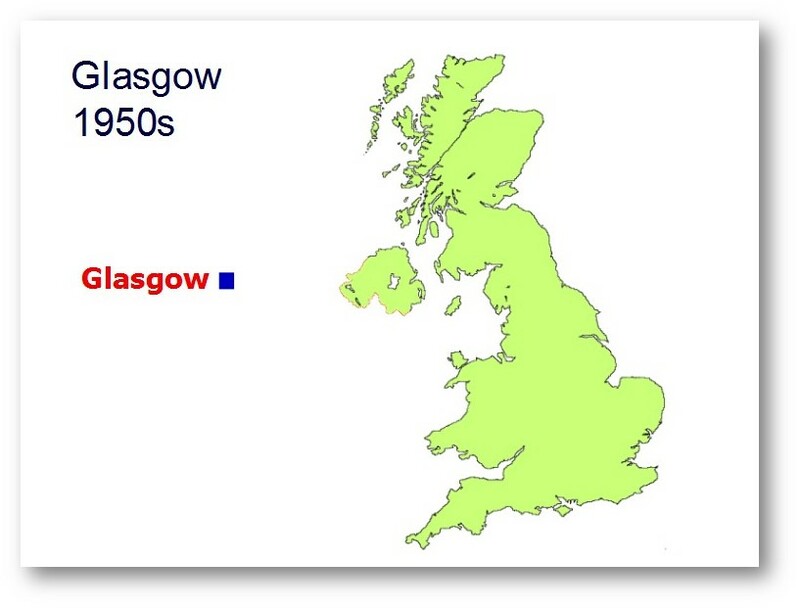 I explained that the writer is from Glasgow and that the story is set there in the 1950s. Under direction from pupils, I moved the blue blob to the correct place on the map on the IWB. 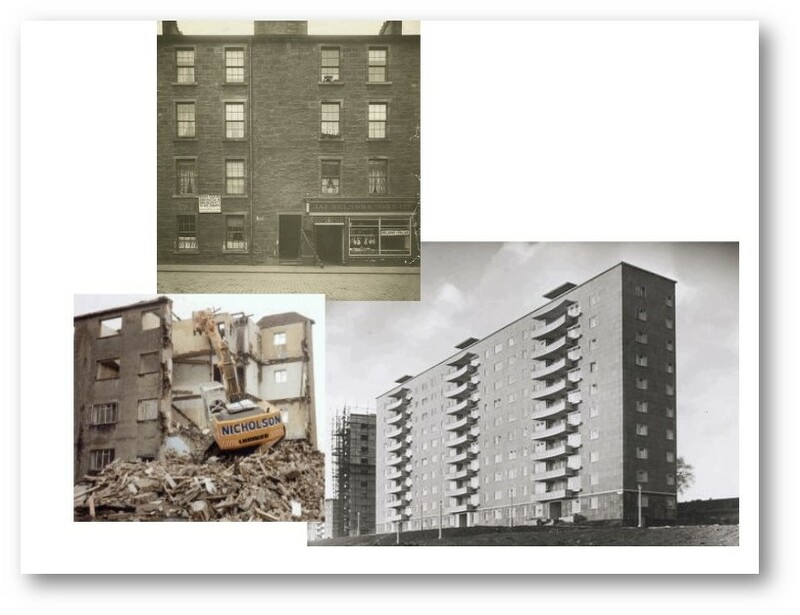 I briefly explained ‘tenements’ and a bit of their history, focusing on poor living conditions and lack of space – and the lack of privacy for families in single rooms. I asked pupils to look out for references to these things in the story. 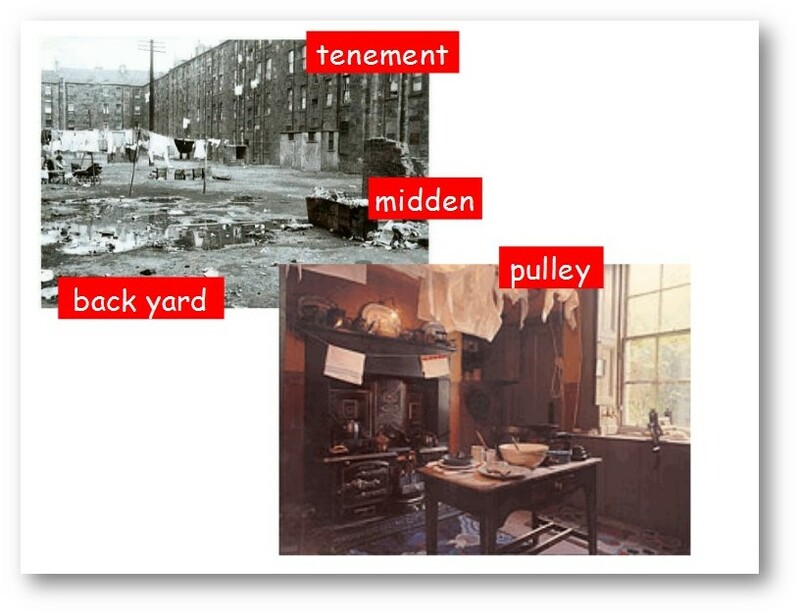 I explained the importance of the enclosed back yard to people’s lives, moving the labels onto the images. I explained these key words that we would meet. We all practised saying ‘midden’ in a Scottish accent. I asked pupils to listen out for these words. I also told them to listen out for the characters listed. I left the slide up for pupils to keep an eye on while listening to the story. Pupils then listened to the story read aloud, uninterrupted until just before the end, at which point I showed the following slide. I explained that there was just one more paragraph left and asked pupils to think individually about what they thought would happen. 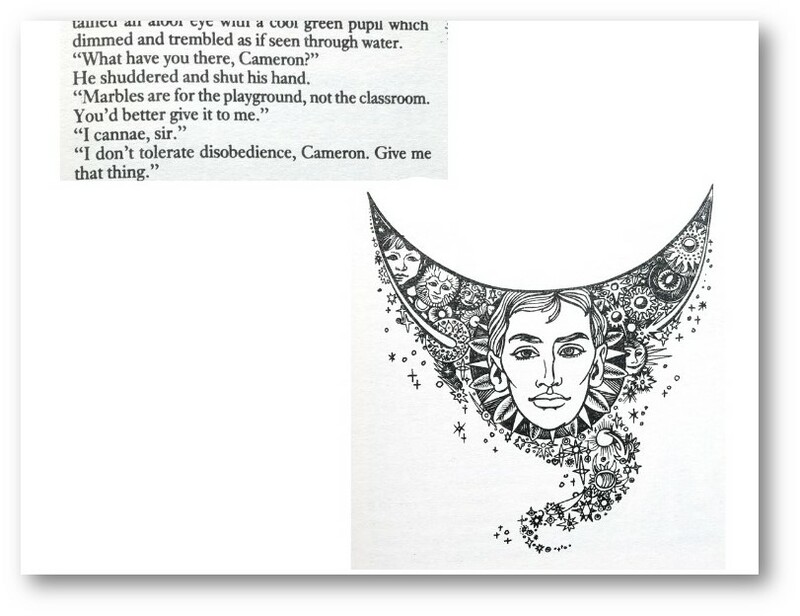 A few seconds in, I gave them this extra clue – the final illustration. After about 30 seconds of pair discussion, I fielded ideas from the whole class. There was some discussion of the details in the image. Is that a small boy’s face? If not, whose is it? I handed out copies of the text. 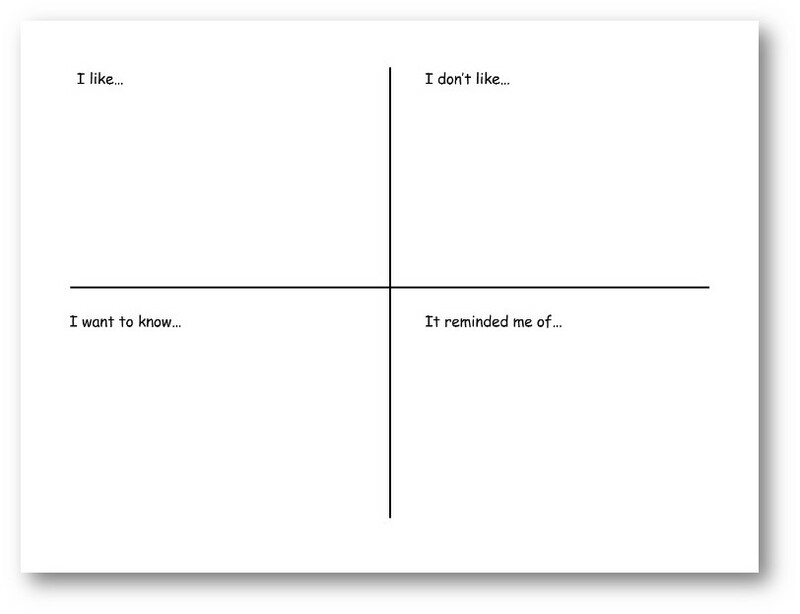 I introduced a ‘tell-me grid’ (thanks to Aidan Chambers) and told pupils that they would be writing ideas on it when they’d read the story once more: something they liked; something they didn’t like; something they wanted to know; and something they were reminded of. I then re-read the story to them. Pupils had option to follow or to start filling in grid as listened. Pupils had a couple of minutes to write ideas silently on the grid. I explained that this was not going to be marked – it was for them to sort out their thoughts. They then swapped these thoughts at their tables, taking it in turns to share their ideas. After a few minutes, I fielded some ideas for whole class discussion, choosing individuals to give ideas. Lots of interesting comments. Some explored further through follow-up questions. I picked up on one pupil’s ‘like’ of the descriptions. Had anyone else put this? Yes – several. I asked the pupil to give an example. Why did she like it? I asked all pupils to look through the story and to underline their favourite bit of description in the story. I then targeted individuals to read out their chosen bits and to explain why they liked them. After a few minutes, I fielded ideas from targeted individuals, opening up to class discussion. There wasn’t time to talk about more than one or two. 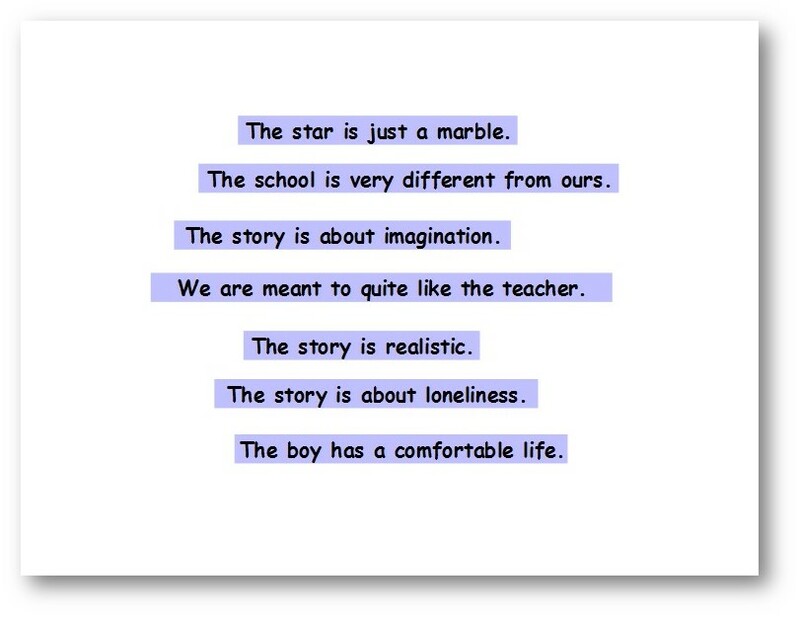 A pupil said the story was about loneliness. Most agreed. I asked for evidence and she referred to the bit where the boy is at the back of the classroom. I asked all the pupils to find that bit and to look at it. We re-read it. I asked follow-up questions about why/how this verbal image made him seem lonely. Was the phrase ‘by himself’ important? We compared it with the ‘boys at the front’. I asked all pupils to find any other bits which made him seem lonely. They scanned the text and discussed in pairs. I then fielded ideas for whole class discussion: the way he is on his own at the start, the mention of being ‘insulted or neglected’, the image of him alone under the sheets. As each bit was mentioned, I demanded the exact wording from the text and that all pupils find it. This was a back-up close-reading activity. 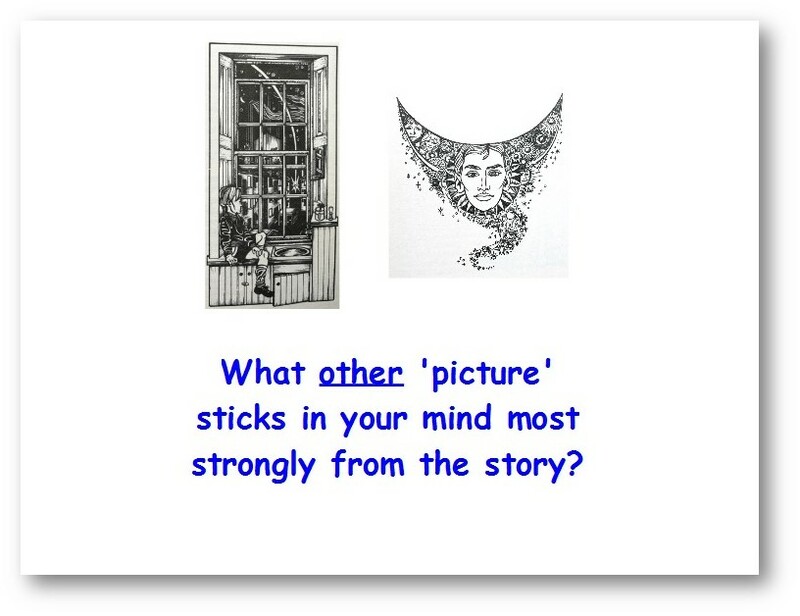 All pupils close their eyes and decide what image sticks most strongly in their mind from the story. They all then find that moment. There is then discussion of why these moments stick. 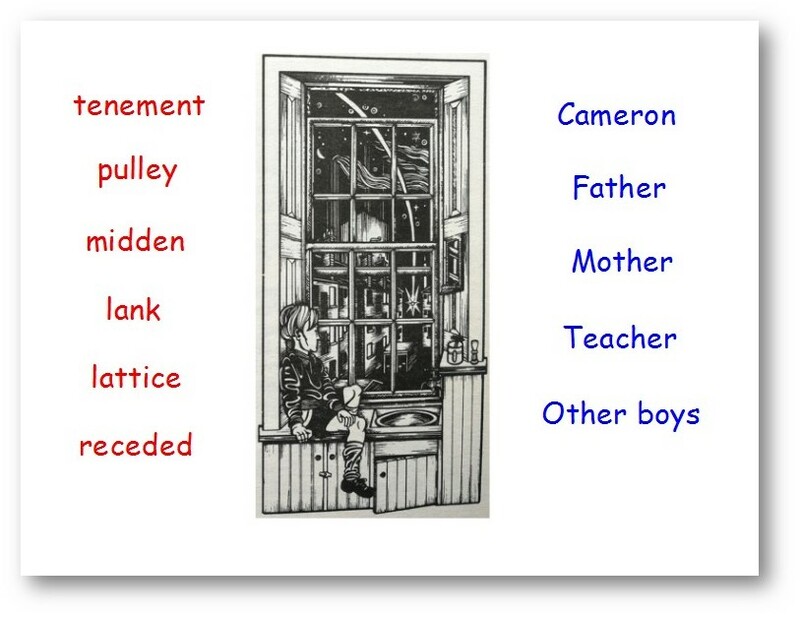 This was a consolidatory, imaginative written task, for pupils to move on to. What an inspiring use of text. Thank you. Is it possible to get a copy of the slides used here? Yes – email me at jamesfjdurran@gmail.com and I can email them to you! mixed-age Year 3 to 6 classes. 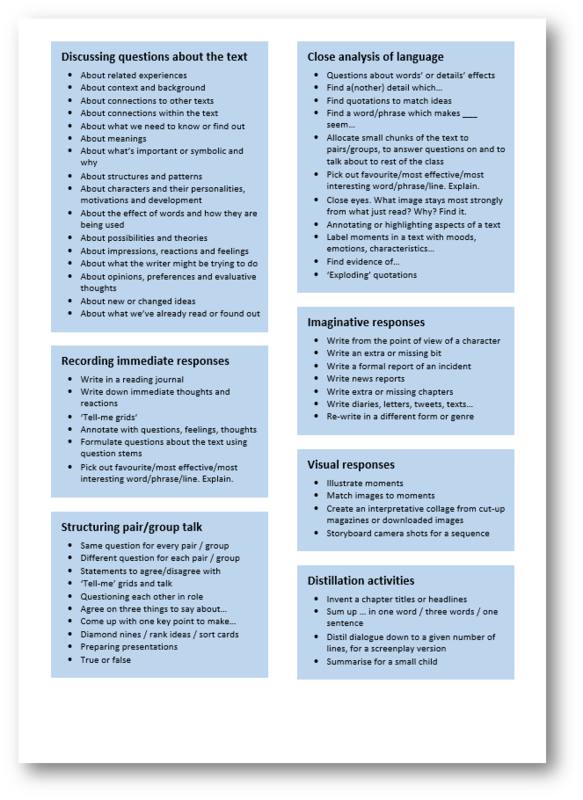 In previous schools I’ve taught in, where there was an obsession with small-group guided reading rotations, I used to diligently pin a guided reading timetable on the wall, then secretly teach it whole class! Luckily, I lead a team of great teachers now, that hugely value whole-class reading approaches and there is no need for such stressful covert operations. 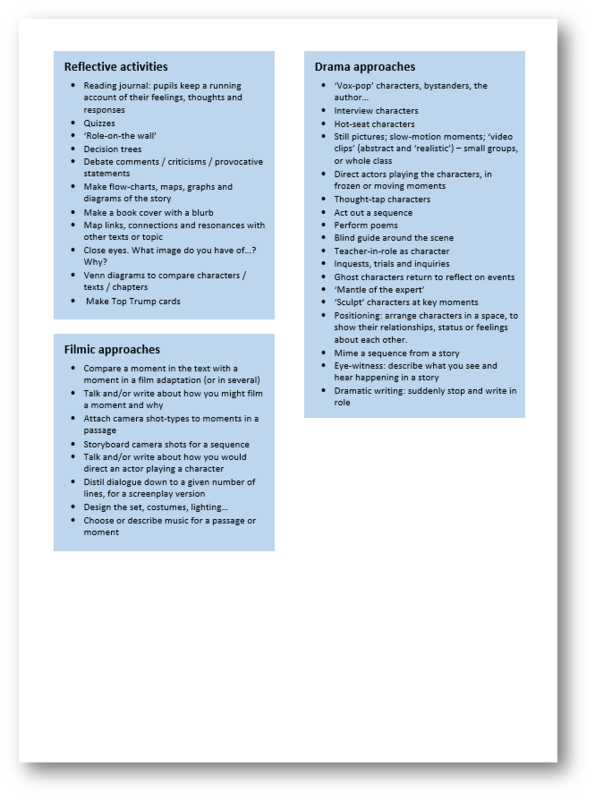 Thank you for this – and for your other blogs too – the content of which I blatantly stole for a cpd session last Monday! Thanks for this: it’s great to hear of what you’re doing. And thanks for your feedback too! All the best for the new term. Thanks so much James. I am also going to use for a CPD session in a few weeks. Please may I ask for a copy of the slides also. 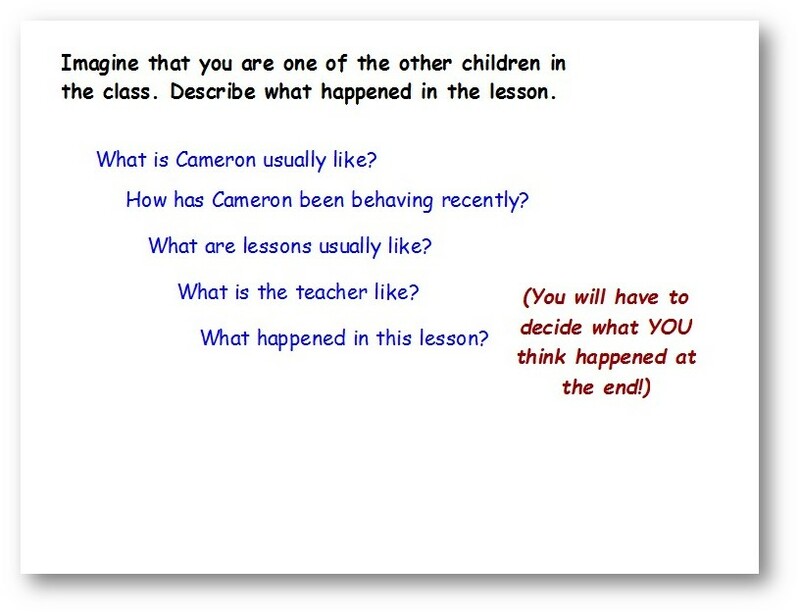 I love this approach and plan to implement in my class.Could I have the slides please? Hi James. This looks great. Please could you email me the slides. Thank you for that really useful blog entry. We’re looking to move to more whole class sessions. Could I please take a copy of your slides too? I have recently started using whole class guided reading and this has been really useful to read. Please could you email me the slides. Thank you. 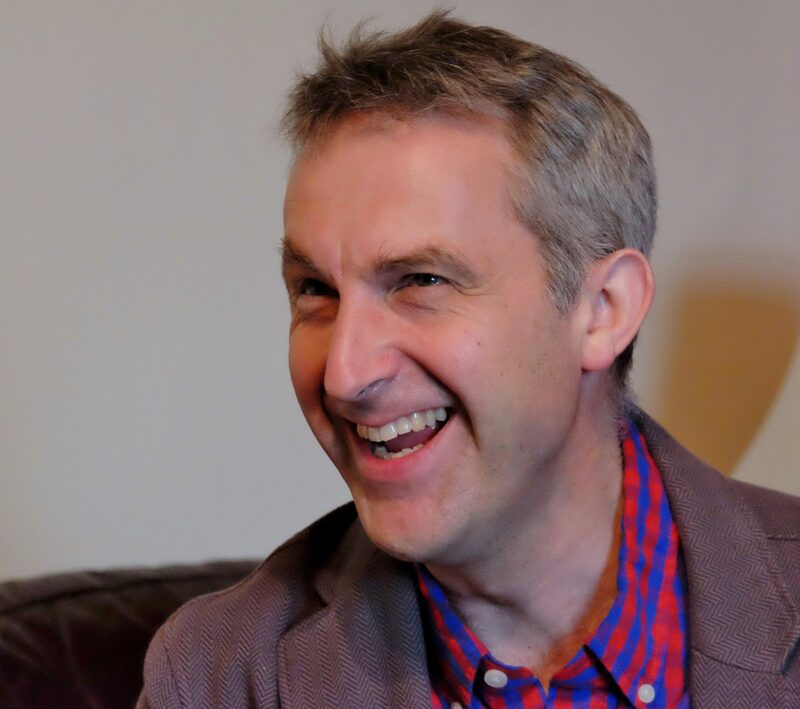 Hi James, I also have just come across this link, its great! Do you still have the slides available? Wow this is just what I need for my interview after half term. Would it be possible to get the slides? I love whole class reading. We are doing this at our school as well as GR groups. Could You email me the slides please. Of course. I think there’s actually a link in the comments, but I’ll check.